We have a new addition or two to the family. George and Mildred have decided to build an annex on our house. In fact, they have built just outside our kitchen window. I have put a little arrow in showing the nest, but even then you can’t see it. I tried a telephoto shoot of the nest, but that didn’t come out too well. And even then it’s hard to see. 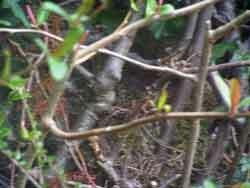 The nest is the lower half of the photo. George took a long time to build that nest. He started off with twigs. Then came the moss. And finally, a nice layer of Sandy’s hairs which I left out nearby. George and Mildred are blackbirds and are having a busy time of it. They are taking turns on the eggs at the moment. The switch-over happens every couple of hours. One will land in the branch just at the window and the other then flies off for a drop of lunch or whatever. Then come evening time, George heads up to the top of the nearest tall tree and joins in with the other blackbirds and thrushes and they all roar their heads off. It’s quite a sound. I just went to boil the kettle, and had a look at the nest. As I watched, George arrived with a beak full of grubs, as Mildred flew away. George did his bit and then he too flew away. So the eggs have hatched. Congratulations George and Mildred. I haven’t seen your offspring yet, as I don’t want to disturb anything. Which goes to prove – you can’t make a blackbird without breaking eggs. Congratulations!! Blackbirds are quite nice in stews. I have a great recipe for squab stew. I guess it would work for blackbird too. We are hoping it’s going to be nice and juicy for Easter. Aw! That’s amazing… wish my little one could see something like that! I just wish I could get some photos. However, the parents are so quick on their feed-flights that I don’t get a chance. I can’t get close enough to the nest to take a photo without disturbing things. Maybe when the fledgling starts coming out to enjoy the sun? cardinals sometimes nest in the evergreens by our front door. which means for several weeks in spring, we come and go by the back door. so as not to bother them. We have set the garden out to suit wildlife, and have a great collection this year. George and Mildred are only one of about four pairs of blackbirds that are nesting here at the moment. It does make life a little difficult as large tracts of the garden are now out of bounds, and I have to keep a close eye on the dog!! On the other hand, I’m exempt from any hedge cutting at the moment ….